Brian McBride was the number one overall pick for the Columbus Crew in the 1996 inaugural MLS Draft. His professional career spanned 16 years, and included three World Cups and 96 US National Team caps. Mr. McBride is a 2014 US Soccer Hall of Fame Inductee, a member of the US Soccer All-Time Men’s National Team Best XI, the first USMNT player to score goals in two different World Cups (‘98 and ’02), a 2008 US Olympic Team Captain, a member of the MLS All-Time Best XI, an eight-time MLS All-Star, scorer of the 1998 MLS Goal of the Year, and Fulham’s Player of the Year in 2005 and 2006. A few years ago Brian and his wife Dina reached out to UI’s co-founder and Executive Director Jim Dower about how they can make a lasting impact in Chicago. 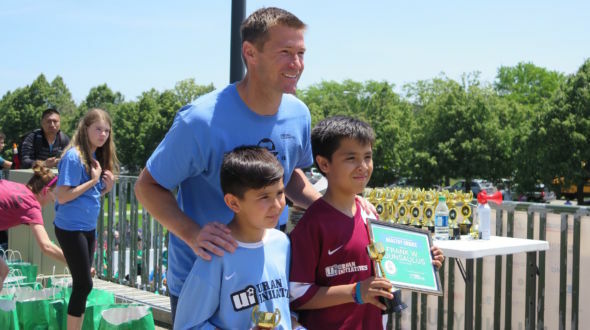 Coach D suggested that they join Team Urban Initiatives and help the thousands of students currently being impacted by the organization’s innovative and quality programing and coaching. Today Brian joins the UI Board of Directors and we can’t wait to have him and his family involved in every aspect of Urban Initiatives. We are excited to have Brian McBride and the entire McBride family on Team Urban Initiatives! Previous Article: Collaboration and Play at Prieto Field Day!